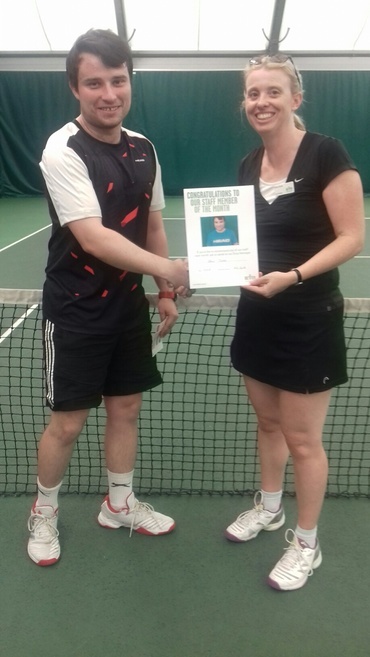 Today, Kerry Quirk Tennis Manager presented Glenn Clarke one of our Tennis Coaches with a £10 ‘Love to Shop’ voucher for being Blackbrook Leisure Centre and Spa’s employee of the month for June. Glenn has shown great enthusiasm for developing tennis at Taunton Tennis Centre and at our outreach venues. Even getting dressed up as Batman and Superman to showcase tennis in front of hundreds of children in our local schools. While also putting himself out to cover other coaches so they can take leave. We are now allowing Glenn to have a week off himself, but he will be back next week. Well done Glenn, our team wouldn’t be the same without you.